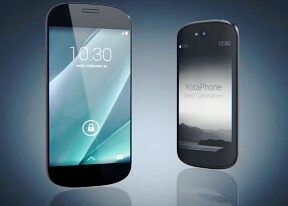 The YotaPhone 2 is running on the Snapdragon 801 chipset - the most popular choice for the 2014 flagships. The chip is still relevant and provides buttery smooth performance on 1080p devices, such as the YotaPhone 2. First, we kick off our performance charts with the CPU-oriented GeekBench 3 benchmark. The quad-core Krait 400, though not as impressive as it was a while back, is still quite capable chap scoring close to Nexus 5 and better than the HTC One (M8). The compound AnTuTu 5 takes in consideration processor, graphics and memory, and here you can clearly see the performance gap the Snapdragon 801-powered generation have created. Another compound test is the popular BaseMark OS II. In addition to the core hardware, it also gauges the web browser performance and outputs a total score. This time around the YotaPhone 2 did as good as any other Snapdragon 801 smartphone would do. The single and multi-core processor performance according to the BaseMark OS II results aren't as good as the S801 gang. The Krait 400 CPU inside the YotaPhone 2 is clocked at 2.27GHz, while the same CPU inside the Galaxy S5 runs on 2.5GHz though. Let's check the YotaPhone 2's Adreno 330 GPU and how it is stacking against the current crop of flagships. All onscreen and offscreen test show the GPU of YotaPhne 2 is about 20% behind the same Adreno 330 @ 578Mhz in the S801 phones. The PowerVR unit inside the iPhone 6 series is quite a beast. BaseMark X graphic benchmark shows pretty much the same thing - the 2014 flagships are 20% better than the YotaPhone 2 when it comes to handling graphics. Finally, we ran the Java-centric Kraken benchmark and the compound BrowserMark 2.1 on the YotaPhone 2's default web browser - Google Chrome. When it comes to Java - YotaPhone 2 is just great, while the overall browsing experience is very good. The Snapdragon 801 chipset inside the YotaPhone 2 is clearly behind the latest competition. The Snapdragon 801 chip in some of the phones comes with a faster processor and thus they are the better performers. But when it comes to real-life experience YotaPhone 2 is flagship-grade. The vanilla Android runs blazing fast and lag-free, while popular heavy games and apps are handled hassle-free.